A map of the local area, with disabled access routes highlighted. Our disabled access map will help you plan your journey to The National Archives. See where to find us for general information about getting here. Kew Gardens station, approximately 0.75 km away, is the nearest rail and tube station to The National Archives. It is accessible to people who use wheelchairs. The station has ramps from both platforms, but no lifts. It does not have step-free interchange between platforms – wheelchair users cannot get from one side to the other. See Kew Gardens’ station access information for more details. The map of the local area shows the route to The National Archives from the eastbound platform (see red dotted line) and the westbound platform of Kew Gardens station (see blue dashed line). You can also get a taxi from Kew Gardens station. Ask a member of the station staff or go to the station office (eastbound side of Kew Gardens) for local taxi numbers or for assistance in calling a taxi. Ask the driver for Bessant Drive (TW9 4AD). When leaving The National Archives you can ask staff at the welcome desk to call you a taxi. 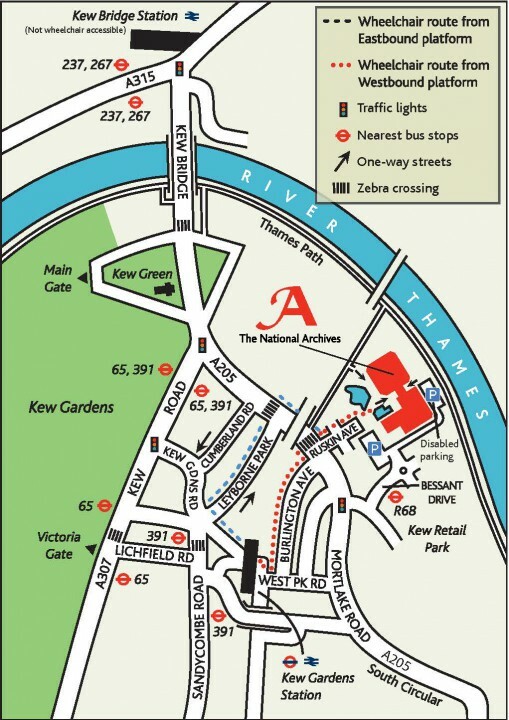 Kew Bridge station is approximately 1.4 km away from The National Archives. It is not accessible to visitors with wheelchairs. Please see Kew Bridge station access information for more details. There is no direct bus service from The National Archives to Kew Gardens station. All London buses are now low-floor buses (wheelchair accessible). All London buses have a retractable ramp and room for one wheelchair user. The R68 bus terminates near The National Archives at the Kew Retail Park. If you are a wheelchair user travelling from Richmond we recommend catching the R68 (from just outside Richmond station) instead of getting a train or tube to Kew Gardens station. There are a number of free accessible parking bays at The National Archives. If you are using a sat nav to find your way here, please use the postcode TW9 4AD (Bessant Drive). On arriving at The National Archives from Bessant Drive follow the sign for the accessible parking bays. You will pass through a security barrier where you will need to inform security staff on the intercom whether you are dropping someone off or parking in one of the bays. Please bring your blue badge. The bays are available on a first-come, first-served basis. If the accessible parking bays are full, the main visitors car park is approximately 200 metres from the main entrance to the building. Both entrances are accessible for people who use wheelchairs. The car park with blue badge spaces is open from 07:00 to 19:30. The main visitors car park is open from 08:30 to 19:30. For information on accessible tube travel and local buses, please use the advanced search options on the Transport for London Journey Planner. See the National Rail website for more information on accessible rail travel.